AT HONG KONG airport, a couple hold an animated discussion about whether to buy a $350 polo shirt from Hugo Boss. 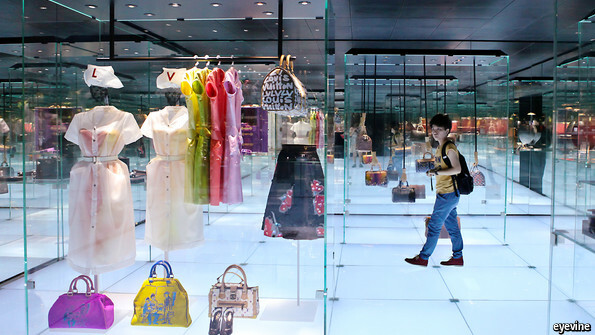 Their conversation, like many in luxury shops across the city, is in Mandarin, the language of mainland China, and not the local variant, Cantonese. The mainland provides a third of the airport’s visitors and many of its most avid shoppers. In 2012, according to estimates by Jonathan Garner and Helen Qiao of Morgan Stanley, a bank, the Chinese spent over 2.3 trillion yuan ($370 billion) on domestic tourism alone. And yet China’s GDP statistics captured only a tiny part of that spending, they argue, as well as missing spending on financial services, health care and housing. As a result, official figures show private consumption languishing at around 35% of GDP. Morgan Stanley’s “bottom-up” calculations, by contrast, imply that it has grown since 2008 to almost 46% of GDP (see chart). Mr Garner and Ms Qiao draw on company reports and industry studies to fill gaps in the official data, which, they say, undercounted consumption by $1.6 trillion in 2012, more tan Australia’s entire GDP. Their calculations echo earlier studies, which also found that official statistics undercount consumption, albeit by a smaller margin. As well as stuff bought offshore, spending online is also undercounted, the two economists argue. On a single weekend in November, Chinese consumers spent more than $3 billion on two websites, Taobao and Tmall (both part of Alibaba, an online giant), in celebration of “singles’ day”, the bachelor’s equivalent of Valentine’s day. But official statistics have failed to keep pace with changing consumer habits, Ms Qiao argues, neglecting entire categories of e-spending. Online gaming, for example, is largely missing. Yet it amounted to 53 billion yuan ($8.5 billion) last year, according to Morgan Stanley’s tally of revenues earned by online gaming firms. 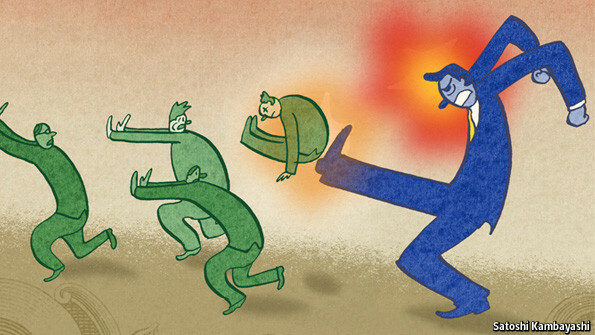 China’s statistics have long been viewed with scepticism or worse. Some economists worry that they fail to reflect reality, others that they slavishly reflect political imperatives. In 2002 Thomas Rawski of the University of Pittsburgh complained about a “tornado of deception”. Five years later Carsten Holz, then of Princeton University, said that official statistics should be taken with a “rock of salt”. When Li Keqiang, now China’s prime minister, was party chief of Liaoning province in 2007, he called the province’s output figures “man-made” and “for reference only”. But things are not as bad as they were. China’s National Bureau of Statistics (NBS), for example, long ago stopped relying on provincial output figures to calculate national GDP. China’s economic census in 2004 gave the national statisticians a better baseline for subsequent work. In 2006 a book published by the OECD argued emphatically that China’s national accounts are inevitably “wrong”, in that they are forced to plump for one of a range of plausible figures, but that they are not politically manipulated. But the NBS does not make it easy for independent outsiders to cross-check their work. Sceptics instead look for inconsistencies between China’s growth figures and other indicators, such as power generation or cement output. To track Liaoning’s economy, Mr Li looked at rail cargo, bank lending and electricity consumption. Inspired by his example, three economists at the Federal Reserve Bank of San Francisco have distilled an alternative national growth index from three similar items. (It is a more sophisticated version of our own “Keqiang ker-ching” index published in December 2010.) They discovered that, contrary to popular belief, China’s growth figures are in the “same ballpark” as Mr Li’s indicators. Not every statistical distortion serves to flatter China. Indeed, some of the biggest remaining flaws in China’s statistics are politically awkward. The official figures may, for example, exaggerate the politically sensitive income gap between urbanites and rural folk by as much as 40%, according to Jinjun Xue of Nagoya University and Wenshu Gao of the Chinese Academy of Social Sciences. The understatement of consumption also gives ammunition to China’s critics, who worry that its economy relies too heavily on unsustainable investment and lament the government’s failure to rebalance the economy. Mr Garner and Ms Qiao’s alternative calculations imply instead that rebalancing is under way. In estimating consumption’s growing role, they assume that the hidden spending is not captured elsewhere in the GDP figures. If, in fact, this extra spending is misrecorded as something else, then consumption’s share of GDP would be even bigger. Not everyone doubts the purchasing power of China’s consumers. At Hong Kong airport, adverts tempting customers to splurge compete with official notices designed to put them off one kind of purchase in particular. Since March 1st anyone taking more than two tins of milk powder out of the territory faces up to two years in prison, an embargo designed to retain Hong Kong powder for local mothers, amid concerns on the mainland about the safety of Chinese milk powder. 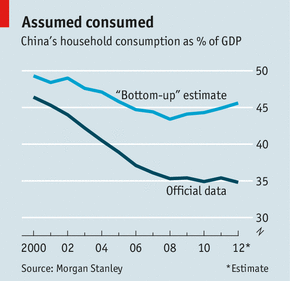 China’s statisticians are not the only ones suppressing consumption. The paper says that if the public thinks inflation will rise, families and companies will seek to avoid the looming higher prices by spending their money now, in turn driving up growth. Importantly, New York Fed staff economists Gauti Eggertsson and Marc Giannoni, the paper’s authors, say this option is open to the Fed only in emergency circumstances. When short-term rates hit 0%, as they currently have, “anticipated inflation is far from neutral, with output increasing if inflation is anticipated to rise,” the central-bank economists wrote. ”Contrary to the common belief that inflation is less effective at stimulating output when inflation becomes more and more anticipated, the benefits of higher anticipated inflation can be extremely large” when short-term rates can be cut no further, the paper states. The paper suggests the Fed could manipulate expected inflation via its official inflation target, which is currently fixed at 2%. “It may be beneficial to let the near-term inflation target move over time in a way that depends on the state of the economy,” Messrs. Eggertsson and Giannoni wrote. “Output and inflation can be stabilized more effectively by raising targeted inflation in the medium run,” they wrote, as long as the change occurs relatively quickly after the shock that waylaid the economy. The paper’s findings are sure to be controversial, both within and outside of the Fed. The research was released as part of the New York Fed’s regular publication of analysis and as such, it does not indicate the central bank is about to change its policy stance. Fed officials have said time and time again they remain committed to keeping prices stable, even as they pursue some of the most aggressive and unorthodox stimulus policies seen in the institution’s history. Burned by high inflation, surging unemployment and stagnant growth of the 1970s, the central bankers are loathe to let price pressures rise much, for fear they will spiral out of control again. That said, the extraordinary level of stimulus seen in recent years has created widespread fear of a huge surge in inflation. Thus far, those anxieties have not been realized. Inflation continues to hold below the Fed’s official target of 2%, and most central bankers expect that to remain the case over the next few years. What’s more, even the most dovish officials are hesitant to argue in favor of using higher inflation to spur growth. That said, a number of central bankers have argued that their target is not a ceiling, and that prices can reach more than 2% if they are expected to ebb in relatively short order. Central bankers have also muddied the waters when it comes to their inflation-fighting commitment. Last December the Fed announced thresholds that govern the possible timing of interest-rate increases, saying rates will stay near 0% until what is now a 7.7% unemployment rate edges down to 6.5%, so long as expected inflation stays at less than 2.5%. For some observers, the higher price threshold suggests a reduced commitment to keep prices in line with the target. One of the strongest advocates for the threshold regime, Charles Evans of the Chicago Fed, has argued that because the Fed is undershooting its mandate to promote maximum job growth, it might have to be willing to accept a modest rise in inflation above the target as the price of dealing with the unemployment problem. So far, no central bankers have said it would be a good idea to intentionally drive expectations over the Fed’s target rate as a tool to create better growth. Instead, central bankers have relied on massive bond buying programs and enhanced guidance about the future path of rates to provide stimulus when it could no longer be found from more traditional sources such as short-term rates. Europe has long been far too tolerant of moral hazard in its banking system. But with the Cyprus plan, the pendulum may now be swinging too far in the opposite direction. This danger was made clear when Jeroen Dijsselbloem, the Dutch president of the eurogroup of finance ministers, rocked financial markets on Monday by hinting at a new doctrine that would put the full burden of future bank restructuring on creditors and depositors rather than taxpayers. In his words, “where you take on the risks you must deal with them, and if you can’t deal with them then you shouldn’t have taken them on”. In July 2007, the opposite position was enunciated by Jochen Sanio, then Germany’s top financial supervisor. As IKB, a medium-sized German bank, revealed massive subprime-related losses, he argued that not bailing it out would trigger “the worst financial crisis since 1931” – an intentionally frightening reference. EU countries have since then implemented the “Sanio doctrine” by scrupulously reimbursing all creditors, including junior ones, of almost all failed banks with few and rather small exceptions in Denmark, Ireland and the UK. That this consistent dismissal of moral hazard originated in a German decision is ironic in light of later events. Then change has come, gradually. In Deauville in October 2010, Angela Merkel, German chancellor, and President Nicolas Sarkozy of France announced that holders of euro area sovereign debt could face losses, but soon afterwards Ireland was still forbidden from “burning” senior bank bondholders. However, policy makers slowly realised that guaranteeing all bank liabilities reinforced a damaging “doom loop” between banks and sovereigns. In July last year, Mario Draghi, president of the European Central Bank, noted that “the question of burden sharing with senior bond holders is evolving at the European level”. Spain’s bank restructurings later that year imposed losses on many subordinated creditors. Earlier this year Ireland negotiated a deal that involved a loss for some senior bank bondholders. A largely silent revolution was instilling more market discipline into the financing of Europe’s banks. This gradual shift was welcome. But in Cyprus it accelerated out of control, all the way to full “Mellon doctrine”. The island’s two biggest banks are now being liquidated, even though the process is administrative rather than judicial, with no government financial assistance. In an echo of Deauville, European leaders signalled on March 16 that deposits were no longer safe, after which the German finance minister Wolfgang Schäuble confirmed that deposit guarantees were “only as good as a state’s solvency”. This move annihilated trust in Cypriot banks and made the imposition of capital controls inevitable. Just as the Sanio doctrine was made unsustainable by moral hazard and fiscal constraints, the Mellon doctrine is made unsustainable by the reality of systemic risk – today as in the 1930s. In fairness to Mr Dijsselbloem, he acknowledged that governments may not impose full financial discipline “in times of crisis”, but then implied that we are in no such times right now: a heroic claim. Governments have a responsibility to protect their citizens from catastrophic meltdowns. This is why a chastened US government had to bail out AIG, the insurance group, a day after letting Lehman Brothers go bankrupt. As the US learnt the hard way, predictability is essential in such matters but also difficult to attain. Europe must now chart a path between untenable Sanio and unrealistic Mellon. The trade-off is not only between moral hazard and systemic fragility, but also between national fiscal responsibility and European integration. The eurogroup’s new insistence that “all insured depositors in all banks will be fully protected” may or may not be seen as a form of “deposit reinsurance”, meaning that a deposit guarantee can indeed be stronger than a member state’s own solvency. But this declaration will have little impact on depositors’ behaviour unless a European backing of national deposit guarantee systems is made explicit. Similarly, the insistence on orderly bank restructurings in an integrated market calls for a centralised process, which should be in place before the ECB conducts a comprehensive balance sheet assessment of all 150-odd banks transferred under its direct supervisory authority, a deadline now planned around mid-2014. The clock is ticking. Instead, the proposed EU regulations cover managers of mutual funds or UCITS (undertakings for collective investment in transferable securities). These vehicles cannot use borrowed money on anything like the same scale as a hedge fund. Most of them use no borrowed money at all. Even if a geared UCITS were to collapse, it is hard to imagine it having the same ripple effect as a bank failure. Many technology funds fell by 90% or more after the dotcom bubble burst, without any apparent systemic effects. Even if the funds were a systemic threat the proposal would still be flawed, as an EU agreement last month to limit bankers’ bonuses shows. That will simply encourage banks to replace bonuses with higher base salaries, in turn making it harder for firms to control costs in a downturn. The best way of reducing bankers’ pay in the long run is to insist that banks hold more capital, thereby cutting returns. The higher capital ratios imposed under the Basel 3 regime do indeed seem to be bringing bonuses down. Do bonuses need regulating because European politicians think fund managers are overpaid? If so, one remedy lies in the hands of their domestic governments, which are free to raise taxes on high earners. A better answer lies in the hands of fund managers’ clients. Fund management is not a monopoly. No one is forced to give money to an active fund manager, someone who picks stocks in an attempt to beat the market and potentially earns a high salary if he or she achieves it. Investors are at liberty to pick a passive fund, one that simply tries to track the index at much lower cost. Over the long term the evidence suggests that the average investor would be better off taking the cheaper option. Because active managers charge higher fees, they can reward intermediaries such as financial advisers and brokers with commissions when they persuade clients to put money into their funds. The fees of passive managers are too small to share out in this way. Commissions create a conflict of interest that governments can prevent by making sure advisers are paid by clients, not by product providers. The British government did just this in its “retail distribution review”, a set of new rules on financial advisers that came into effect this year. In contrast, the European Parliament voted against banning commission payments last September. So the proposal to regulate fund managers’ pay looks bad in principle. It looks even worse in practice. One of the parliament’s ideas is that fund managers should eat their own cooking by holding at least half of their bonuses as investments in their own funds. However, most UCITS are not open to American investors, so many US-born fund managers would not be able to hold units in their funds. As well as being impractical, the ruling may not truly align the interest of managers and clients. Suppose a manager runs a fund investing in smaller Vietnamese companies. An institutional investor might put only 1% of its portfolio in such a fund in the hope of high but volatile returns. In contrast, the proposed EU rules would force a fund manager to have a large proportion of his wealth in such a vehicle. That might make the manager more cautious—holding a lot of cash, for example—thereby acting against the best interests of the client. Luckily, there is a long way to go before this deeply flawed proposal becomes law. First the whole parliament has to approve it; after that it has to pass muster with national governments and the European Commission. Britain, which was isolated when it came to the restrictions on bankers’ bonuses, will get some support from other EU countries with big fund-management industries. But the proposal gives a sense of the mindset of many European politicians. They want to give finance a kicking and mutual-fund managers just happened to be in range. “I wouldn’t be surprised to see a 20pc fall in real GDP,” said Nobel economist Paul Krugman. The country has just lost its core industry, a banking system with assets equal to eight times GDP, and has little to replace it with. Cyprus cannot hope to claw its way back to viability with a tourist boom because EMU membership has made it shockingly expensive. Turkey, Croatia or Egypt are all much cheaper. Manufacturing is just 7pc of GDP. The IMF says the labour cost index has risen even faster than in Greece, Spain or Italy since the late 1990s.